It is said that finding your soulmate takes time. This statement rings true for a number of adult cats currently awaiting adoption. Some of the fantastic felines in our care have been waiting for their opportunity to find their forever home since winter. With the festive season upon us, we would love nothing more than seeing our long termers go on to find their forever homes in time for Christmas. Could you offer the home environment they are looking for? This isn’t the first time we have featured the ginger feline with the big personality. Sadly, while his shelter companions have gone on to find their forever homes, one year-old Norton has been patiently waiting for his ideal family at our North Melbourne shelter for 119 days. 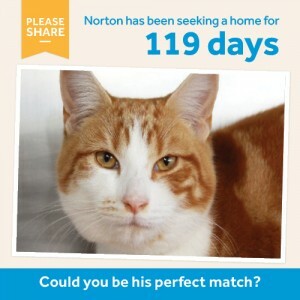 Equal parts affectionate and playful, Norton is the full package. This inquisitive, affectionate and goofy cat is the perfect addition to any family looking to adopt a pet during the school holidays. Norton is a big fan of interactive toys and is perfectly happy spending time playing with Da Bird, chasing lasers and running through a cat tunnel. After a big day of playing, this smoochy boy would love nothing more than to sit on your lap and get a big scratch under the chin! Campaspe resident Precious has built a reputation for doing things on her own terms. This loyal, yet independent feline, three year-old has been looking for her perfect family for 197 days. Precious would suit a quiet home, without small children, where she can find a comfortable spot to have some me time throughout the day. 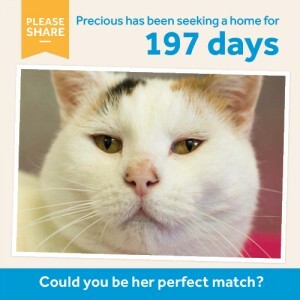 While she does value her own space, Precious is happy to share a home with other cats. Precious likes to build up a bond over time and needs to be the one coming to you, but if you are looking for a cat that will come to you in their own time and let them blossom when they want, Precious may be the one for you. Three year-old North Melbourne resident Baz is looking for a home where he can be treated to the finer things in life. Looking for his forever home for 85 days this affectionate feline has a sweet and affectionate nature – and he is not afraid to show it! An outgoing cat with a playful personality, Baz is happy to spend his days around his favourite people. 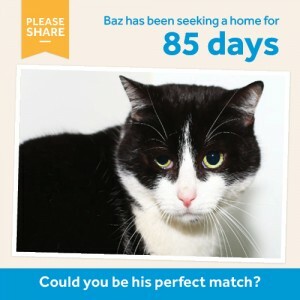 Baz would make a great pet for a family with older children who are looking for a playful addition to the family.